By day, Saurabh Bagchi, Gerhard Klimeck, Mark Bell and Andrew Weiner focus, respectively, on distributed systems, nanoelectronic device modeling, signal processing and ultrafast optics. Their work demands deep thinking, risk taking and studied analysis. To recharge their energy and spark their creativity, each professor turns to activities that take him into entirely different worlds. 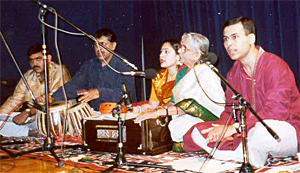 When Saurabh Bagchi was in the fifth grade, he recalls, “My mom would drag me to the music school kicking and screaming. I had no desire, but she persisted.” There, he learned to play the classical music of famed Indian songwriter Rabindranath Tagore on the harmonium, a keyboard instrument powered by air forced through bellows. Today, he turns to the same instrument and music to relax and refuel. 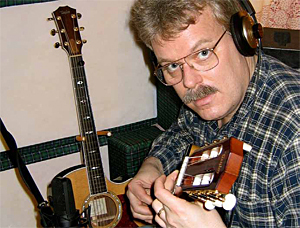 When Mark Bell came to Purdue from California in 1989, it had been several years since he’d played guitar, an instrument he learned at age 10. “When I was a kid, I was interested in being a studio musician, so I learned many types and styles of guitar: electric, acoustic, classical, jazz, blues and instrumental rock. In college, teaching guitar was a great way to make extra money,” he says. Mark Bell: Creativity is key in engineering and scientific research, if you're not creative, you're rehashing the same old things. In Indiana, he began playing again. “I figured I could justify taking an hour or two a day to practice because most people watch more TV than that, and I don’t own a TV,” he says. Today, he most enjoys playing jazz and classical guitar, and composing. Give Gerhard Klimeck the steep, rough terrain of a double black diamond ski slope, and his mind is immediately cleared of all but the task at hand. “It takes extreme concentration and exertion,” he says. “I can completely exhaust myself on challenging runs.” When he can’t ski, soccer fills a similar bill. Gerhard Klimeck: Skiing and soccer get me away from work. After I focus on one of these, it lets me think afresh. Klimeck takes to anything that requires physical exertion, he says. “I love the great outdoors. Getting away helps. Seeing nature, getting different perspectives, getting distance — all those certainly help my creativity,” he says. Some of his favorite skiing spots include La Villa in Dolomites, Italy; and Aspen Highlands and Steamboat Springs, in Colorado. 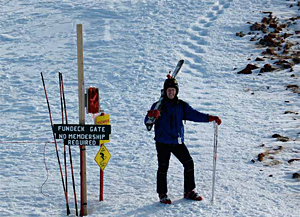 Not all of his skiing or sport is devil-may-care these days, however. He’s taken his 5-year-old son on a green run and to the soccer field, and soon will introduce his 3-yearold daughter to the gentler slopes and fields. 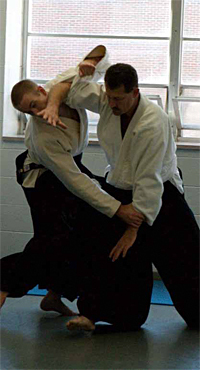 Of aikido’s many benefits, two in particular influence the work of Andrew Weiner, the Scifres Family Distinguished Professor of Electrical and Computer Engineering. Andrew Weiner (right): The respect aspect (of aikido) is very important in our professional lives, too. Weiner first took up the rigorous, noncompetitive Japanese martial art as a seventh-grader, stepped away a while, then returned as an adult. Today, he’s chief instructor and advisor for the Purdue Aikido Club, and he’s achieved the Nidan rank, a second-degree black belt.